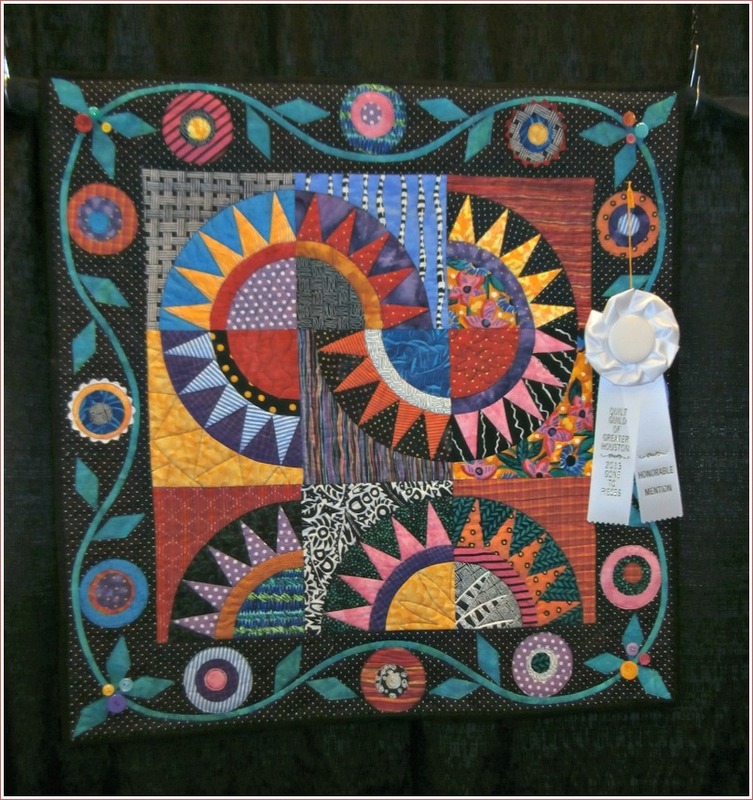 This bright, geometric design garnered one of the prizes at the GHQG 2013 Quilt Show. 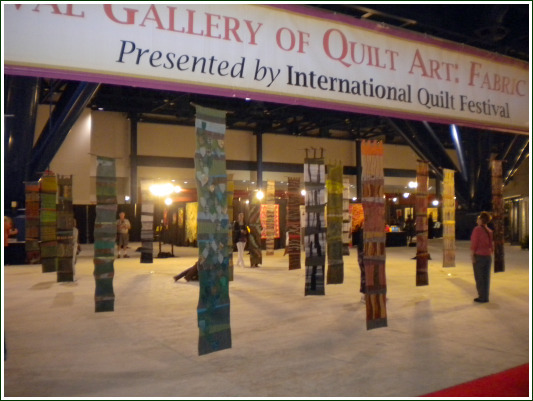 Though I’ve attended the huge Houston International Quilt Festival many times, the guild show was just the ticket to enjoy a couple of hours of looking at members’ exhibits and vendors’ booths filled with fabric, notions, and all other things “quilt”. 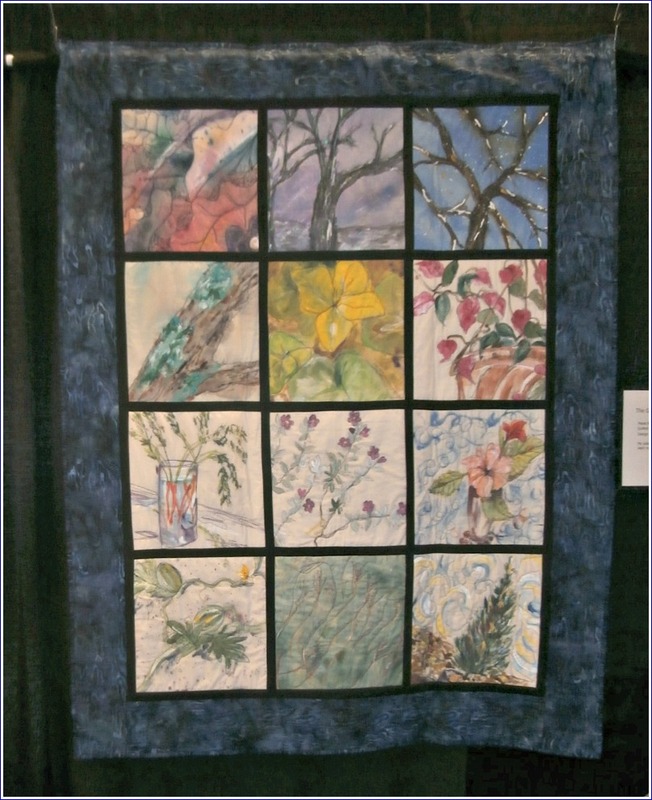 While many entries at the “big” Houston quilt show can be out of my league in what I might attempt in quilt making, most of the exhibits at the local guild show serve more as inspiration to get me back into creating something from all the containers of fabric upstairs. This group quilt was one of my favorites. 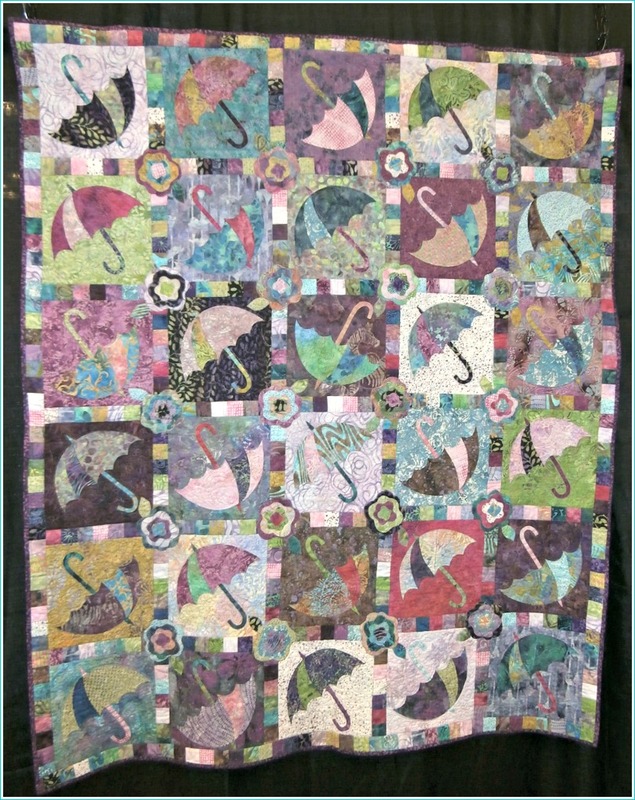 This close-up shows all the hard work that went into making this group quilt. 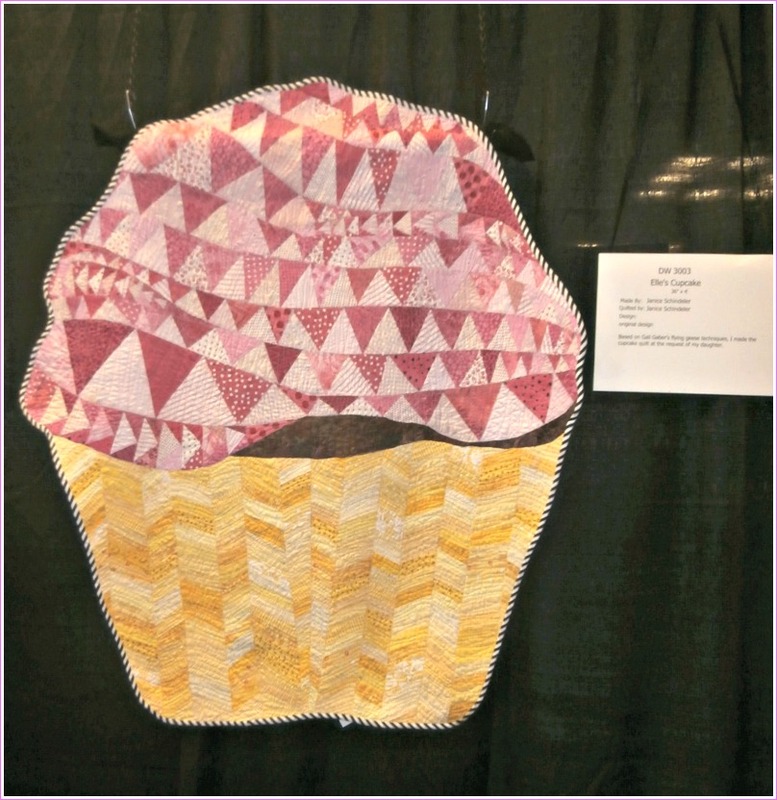 Unique, cupcake quilt, deliciously put together. 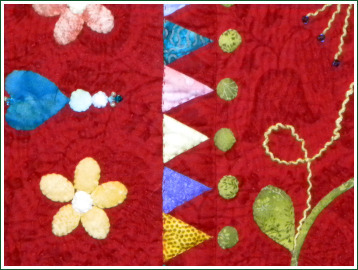 This close-up reveals some of the intricacies of piecing and stitching. 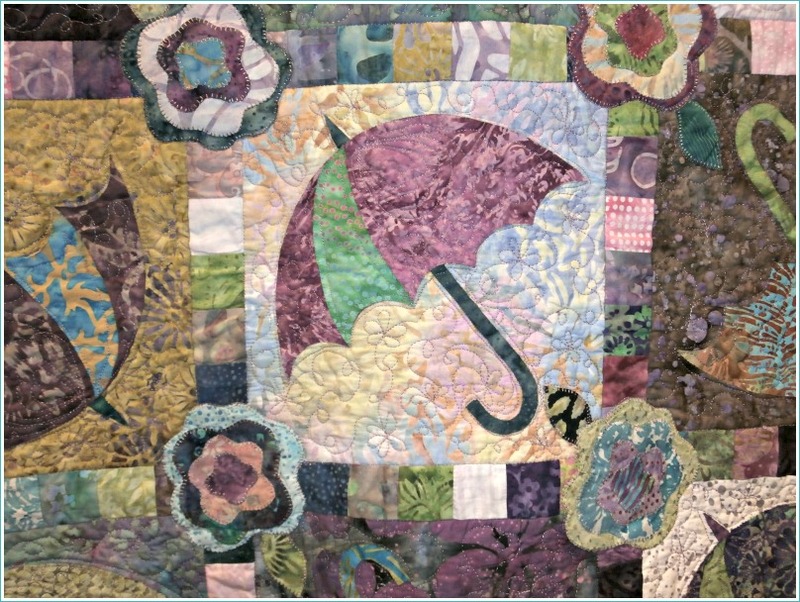 Colorful and detailed umbrella quilt. Hand-painted blocks represent a garden during each month of the year. I gathered up my laundry and traipsed it over to the laundromat, with my head full of all the changes that are coming with the move. Yep, it’s almost most a done deal, with the closing less than two weeks away now. For many, I suppose, there’d be no question about the choice between living in a large apartment complex and owning a home of one’s own. For me, someone who has lived in apartments most of my adult life, there are things about apartment-living that I will miss. I like being around people, and even though, in most large apartment complexes like this one, you don’t get to know most of your neighbors so well, there’s a comfort in seeing different people, saying “hello”, and at times, having a chat. Another plus is that there’s not much responsibility; if something needs fixed in your place, you can call the management, and if the management company is a decent one, you get the repair done in a timely manner, no cost to you. There can be negatives, of course, like problem neighbors and management that is either too lax or too “into everyone’s business”, but recently, I haven’t had many problems where I live. Therefore, why make the move, especially a move that will entail 20 miles rather than 5 of driving commute to work? Although it may seem like a minor reason for some, trudging my laundry back and forth to the other side of the complex gets to be more of chore every week. 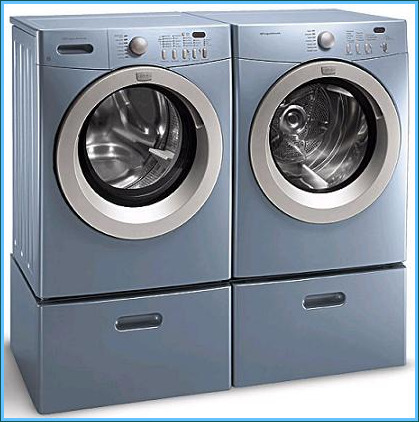 Having my own washer and dryer within steps of my bedroom will be pure luxury. Likewise, having a garage to keep my car out of the elements and away from a parking mate’s dinging car door is something I’ve wanted for a long time. What’s more I’ll have a kitchen, a kitchen with a multitude of drawers, drawers which actually open without having to open up an appliance in order to pull them out; a kitchen with an expanse of counter space on which I can roll out dough and spread out pans for kolaches to rise. (That’s going to be the first big baking that I do.) Then there’s the yard, which, though not overly large, has incredible nooks around the house and garage to hang and set all the plants I have that have needed space to spread out, and which will be the perfect place for a little dog to romp and smell whatever there is too smell. Indeed, I do have mixed feelings about moving, but the pull to do it has been inside me for a long time. So that was on my my mind as I “traipsed” over to do my laundry this morning. So was my mom. “Traipsed” was a word Mom used. She had a very colorful language, and I’m sure I picked up a lot of it. However, being away for so long from the rural area where I grew up, many of these colloquial words and phrases have been pushed back into the recesses of my brain; though, sometimes, my colleagues will raise an eyebrow at some expression that has come out of my mouth and question the usage. I’ve been thinking about some of these different expressions in these last few days because my sister has been in town to visit and attend the Houston International Quilt Festival. On the ride back into town, after we had picked her up at the airport, she began to relate an incident that’d happened on the airplane, and she said, “. . . and these people from up front had to ‘high-tail it’ back to the bathroom.” And “whoosh”, with those words, I was taken back many years ago; it had been so long since I had heard the expression “high-tail it”. This morning, while I was folding my clothes (at the laundromat), I was thinking about my sister using “high-tail it” and remembered how “put out” she had been about these people needing to go to the restroom just when the plane was about to take off. “Put out,” I thought; “does anyone use that expression anymore?” These days, I think people mostly use “put out” with a completely different meaning, a usage neither my mom nor my sister would ever use. I started laughing to myself, remembering something else my mom used to say. Mom was a hard cookie, and could, in fact, say some pretty mean things, but it was a rarity for my mom or my dad to really cuss. One expression that my mom used, though, when she’d lose something or something didn’t turn out right, was “Gosh all fishhooks.” Thinking about that took me back a long time; in fact, it made me think of The Little Rascals. “Gosh all fishhooks” sounds like something that Spanky or another of the characters from that old time show would have said. I looked up “Gosh all fish hooks” but didn’t find any history of the expression, but I did find an interesting article from a small town in Minnesota (which I’d never heard of), which you might like, if you’ve gotten this far in my ramblings. 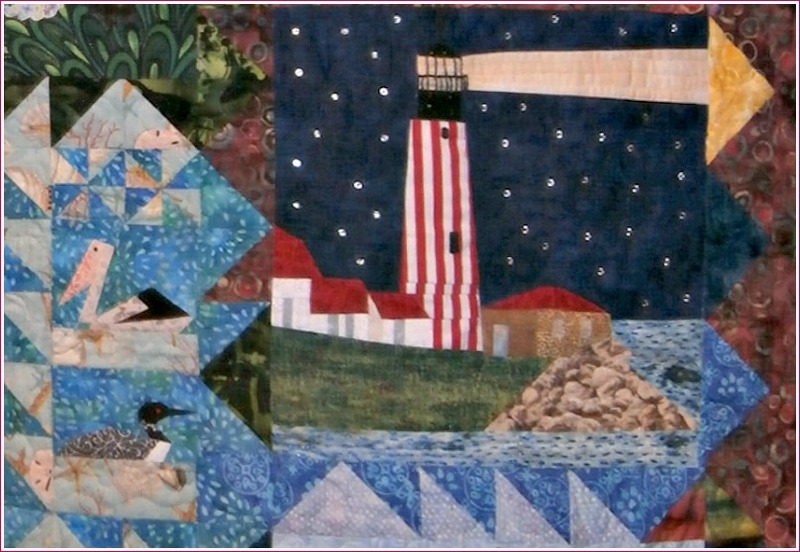 Today was a crazy day, but I had already made plans to go to Preview Night at the Houston International Quilt Festival with my niece, and my sister, who is in town this week especially to attend the event. I hadn’t been for two years, and it felt like it was time to go again. I’m hoping to get some new ideas and new inspiration. 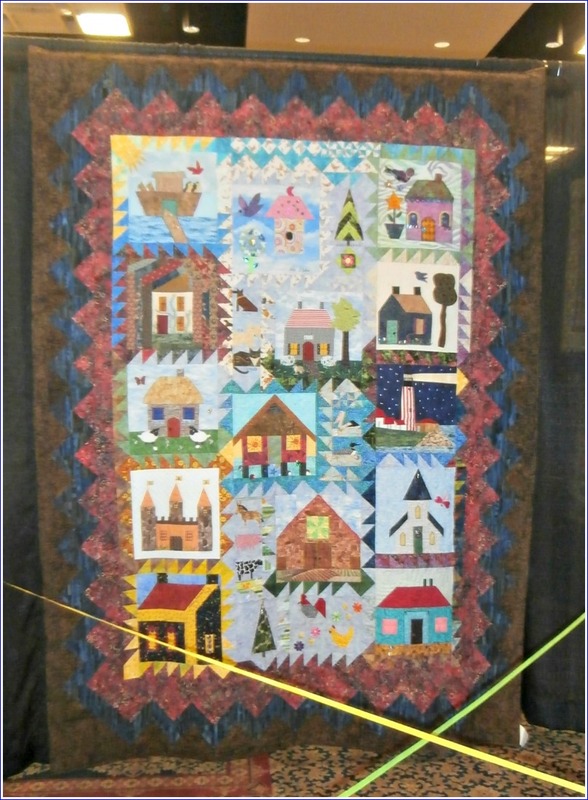 A close-up of applique work and quilting on one of my favorites of the show. The fact is all three of us didn’t have much stamina tonight and about an hour browsing through the main quilt exhibit area and a run through a couple of rows of the merchants’ booths was enough. All three of us complained that our “dogs were barking” after walking around on the hard floors of the George R. Brown Convention Center. 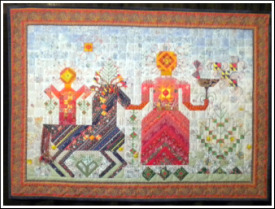 A quilt from the exhibit from Russia. It’s really a great show, especially for first-timers, and there are people who come from everywhere. There were lots of quilts from Japan and other countries. This year there was even a special section of quilts from Russia. Because Preview Night only lasts three hours, when I bought my ticket, I got a free one for another day. I hope I can go back, but the rest of this week probably will probably prove to be no less hectic than the first three days, so if I have the time, I’ll try to go back. The show runs through Sunday, October 18th.